I am the mitzvah photographer for many families at Congregation Bnai Israel in Millburn. Creating bimah portraits of families in this synagogue holds a special place in my heart because both of my children entered Jewish adulthood at Congregation Bnai Israel. There are many wonderful features of Bnai Israel's sanctuary which I love to use when creating family bimah portraits there. The sanctuary is very light, with large windows backing the the entire width of the bimah a the front of the sanctuary. The blue glass windows with the overlaid Jewish star can be used to create a dramatic background for torah reading and other portraits of the mitzvah boy or girl. The skylights further flood the bimah and reader's table area with sunlight, providing the photographer with the options for creating additional looks beyond what can be created with off-camera lighting alone. 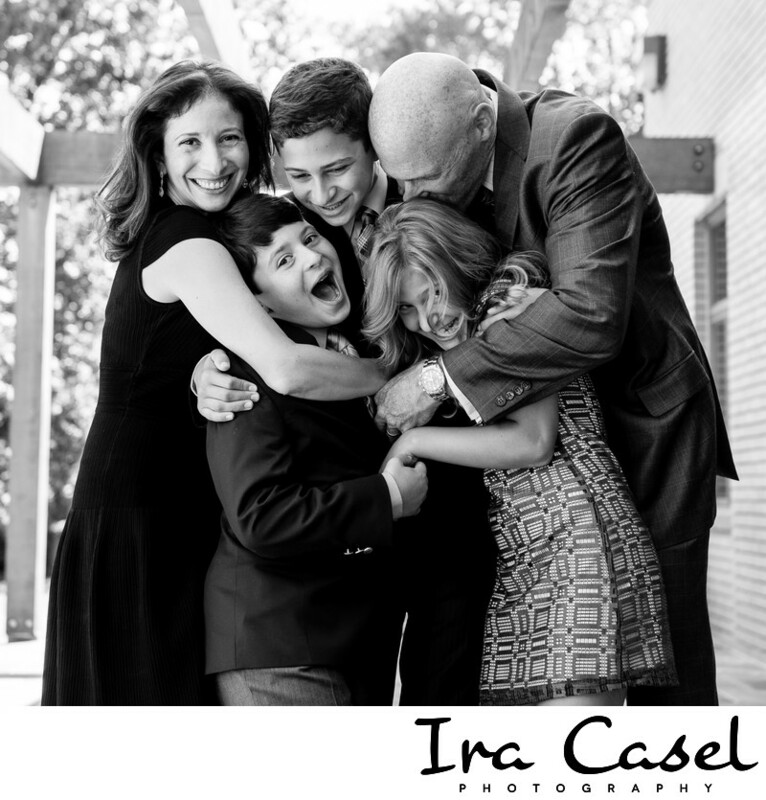 Congregation Bnai Israel also has some outdoor spaces which may not at first look like ideal spots for mitzvah family portraits, but the astute photographer can use them to great advantage. The pergola over the bluestone entrance area can be used to frame a lovely posed or candid portrait as you can see here. Across the way, at the edge of the parking lot, a line of trees can be behind the subject to suggest a quick trip to a nearby park, with no hint that the family is standing in the synagogue parking lot. If you are a member of Congregation Bnai Israel in Millburn, I would love to speak with you about being your family's mitzvah photographer.